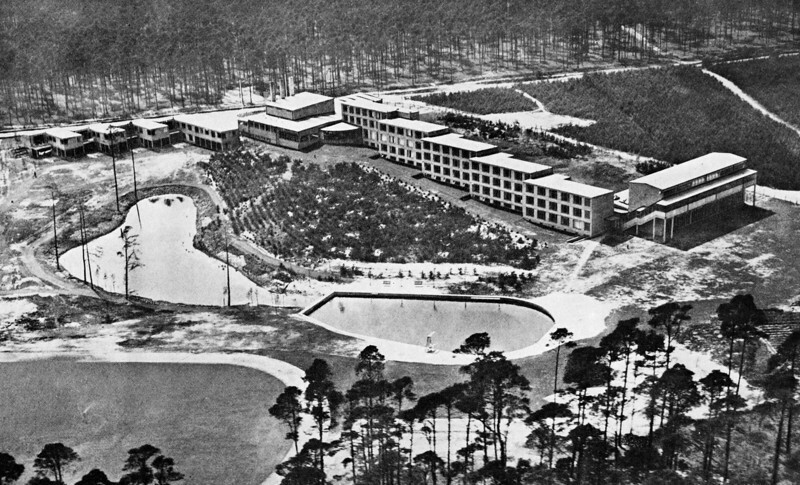 The comprehensive building group comprises dormitories for 120 students, teachers' houses, class-rooms and common rooms - all following in a staggered sequence the natural contour lines of the site and fitting harmoniously into the attractive landscape of pools and pine forests. In the centre, administration, dinning hall and common rooms grouped around the assembly hall. Left, along the road, the teachers' houses; right, along the slope, the students' dormitories terminating on the extreme right with the class-room and seminar rooms. This project, on which we worked enthusiastically in our architectural department under the personal guidance of Hannes Meyer, was awarded first prize, and the plan was adopted for the building. Placed in charge of the project's execution until its completion, I had a great opportunity to acquire building and architectural experience.